A strict correlation between Helicobacter pylori eradication and an increase in platelet count has previously been reported in patients with chronic idiopathic thrombocytopenic purpura (ITP). To clarify the pathogenesis of H. pylori-induced ITP and the factors predicting the platelet response to H. pylori eradication therapy, we evaluated the markers of atrophic gastritis in ITP patients. The study population comprised 31 H. pylori-infected patients with chronic ITP. After undergoing upper gastrointestinal endoscopy and gastric biopsy, all patients received H. pylori eradication therapy. The effect of H. pylori eradication on the platelet count was evaluated for up to 6–54 months after the therapy. The degree of endoscopic gastric atrophy, histological parameters in the gastric mucosa, and serum pepsinogen (PG) levels were compared between platelet responders and nonresponders to the therapy. H. pylori was successfully eradicated in all patients and a platelet response was seen in 18 (58%) of these patients. The serum pepsinogen (PG) I/II ratio at pretreatment was significantly lower in responders than in nonresponders. The degree of endoscopic gastric atrophy was significantly more severe in responders than in nonresponders. Furthermore, the levels of histological parameters of activity, inflammation, and atrophy in the gastric corpus, but not in the gastric antrum, were significantly more severe in responders than in nonresponders,. The development of corpus atrophic gastritis may be a suitable condition for inducing thrombocytopenia. 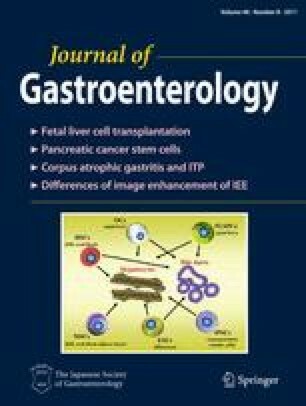 Evaluation of the serum, endoscopic, and histological markers of atrophic gastritis may assist in selecting patients with ITP who are more likely to respond to H. pylori eradication therapy.